Together the US and China account for one-third of global greenhouse gas emissions, according to the White House. Under the agreement, both the US and China set targets to cut emissions by 2025 and 2030, respectively. 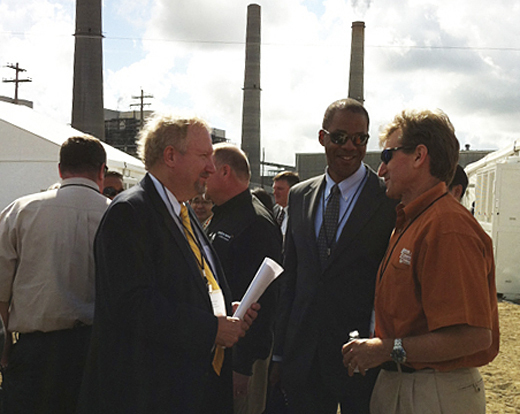 Hovorka told KUT that much of the world's expertise in geologic carbon sequestration can be found in Texas because of its long history of enhanced oil recovery. She also said she's eager to see incentives that encourage widespread adoption of the technology. November 1, 2014: GCCC's Changbing Yang published new papers on groundwater chemistry and CCS in peer-reviewed journals this month; he published numerous additional papers earlier this year. The paper, "Field Demonstration of CO2 Leakage Detection in Potable Aquifers with a Pulselike CO2-Release Test" (link) was published in Environmental Science & Technology. Changbing is lead author and his GCCC coauthors are Susan Hovorka, Ramón Treviño, and Pat Mickler, along with Jesus Delgado-Alonso and Straun Phillips. Two field pulselike CO2-release tests demonstrate CO2 leakage detection in a shallow aquifer by monitoring groundwater pH, alkalinity, and dissolved inorganic carbon (DIC). The study used the periodic groundwater sampling method and a fiber-optic CO2 sensor for real-time in situ monitoring of dissolved CO2 in groundwater. "Process-based soil gas leakage assessment at the Kerr Farm: Comparison of results to leakage proxies at ZERT and Mt. Etna" (link) in the International Journal of Greenhouse Gas Control was coauthored by GCCC's Katherine Romanak (lead author) and Brad Wolaver, as well as George William Sherk, Janis Dale, Laura Dobeck, and Lee Spangler. It uses the relatively new process-based soil gas approach to evaluate CO2 leakage at the Kerr farm in Saskatchewan. The approach was then validated using leakage proxies from a controlled-release and from the Etna volcano. Along with Ramón Treviño, Tongwei Zhang, Katherine Romanak, Kerstan Wallace, Jiemin Lu, Patrick J Mickler, and Susan Hovorka, Changbing published "Regional Assessment of CO2-Solubility Trapping Potential: A Case Study of the Coastal and Offshore Texas Miocene Interval" (link) in the journal Environmental Science & Technology in July. This study presents a regional assessment of CO2-solubility trapping potential (CSTP) in the Texas coastal and offshore Miocene interval, comprising lower, middle, and upper Miocene sandstone. Earlier this year, Changbing was a coauthor on papers about the geochemical impact of oxygen on siliciclastic carbon storage reservoirs (link), modeling of rock-water-CO2 batch experiments (link), assessing capacity in the offshore Texas Miocene (link), and detecting CO2 leakage in potable aquifers (link). You can always find links to GCCC publications on our bookshelf. 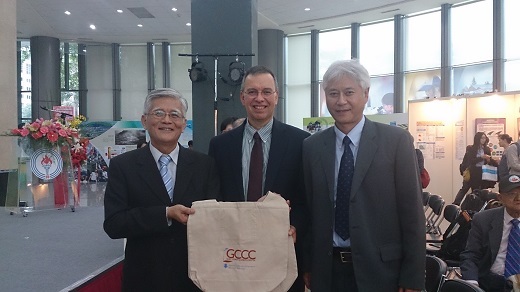 Ramon Treviño brings a token from the GCCC to Director Hu (Ieft) and Dr. Chen-Hui Fan (right), both with CPC. October 27-November 5, 2014: GCCC project manager, Ramon Treviño, attended a series of CCS-related events in Taiwan. 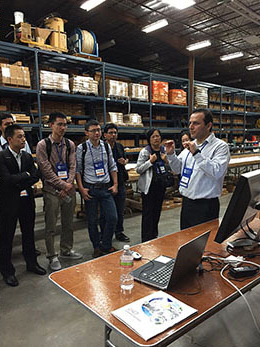 Most of the events were sponsored by the U.S. Department of Energy, National Energy Technology Laboratory (NETL) and the Taiwanese Industrial Technology Research Institute (ITRI). 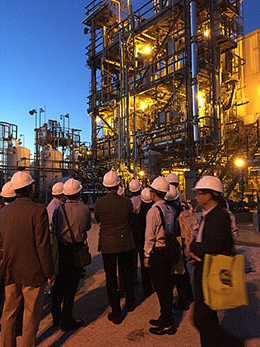 The activities began with a field trip to two depleted gas fields (YHS and TCS) operated by GCCC Sponsor, China Petroleum Corporation, Taiwan (CPC). The YHS field is being considered for pilot CO2 injection, and the TCS field is a gas storage field. Trevino participated in a 3-day workshop in Hsinchu, Taiwan and 1-day symposium in Taipei, where he presented "Capacity Estimates: Methods and Examples," "Offshore / Subsea Storage Opportunities and Risks: A Case Study from the Gulf of Mexico," and "Diverse MMV Tools at SECARB's "Early Test – Cranfield, Mississippi, USA: An Excellent Case Study." Following the workshop, Treviño attended a presentation by Taipower, the Taiwan Power Company, a state-owned electric power utility providing electric power to Taiwan and off-shore islands of Republic of China. The presentation and the following informal discussion centered on the recently completed 3000 m stratigraphic test that Taipower drilled in the near-shore portion of the Tai-hsi Basin. Taipower is considering the Tai-hsi basin as a future CO2 sink. Treviño also attended the "Taiwan CPC Exploration & Development Research Institute Research Results Exhibit" at CPC headquarters. Four GCCC posters were presented, and Trevino was invited by Shin-Tai Hu, Director of Exploration & Development Research Institute, to address the audience regarding GCCC's current CCS efforts and CPC's support as a Sponsor. October 6-9, 2014: GHGT-12. GCCC staff played an integral role in this most prestigious international CCS meeting, which hosted 1150 attendees from 35 countries in Austin, TX. Susan Hovorka was a member of the steering committee, involved with presentation selection as well as the technical program. GCCC staff gave a variety of talks and poster presentations, and also opened their doors to close to 100 attendees during an evening open house. GCCC staff gave eight oral presentations during the technical sessions. Tip Meckel and Ramon Treviño presented, "High-resolution 3D seismic investigations of the overburden above potential CCS sites of the inner Texas shelf, Gulf of Mexico, U.S.A." Seyyed Hosseini presented, "Time lapse compressibility monitoring for detection of CO2 leakage in brine aquifers." 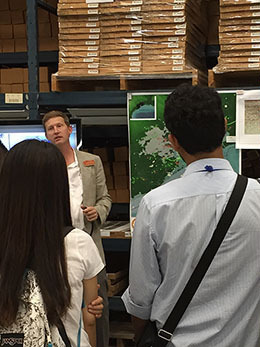 Jean-Philippe Nicot, Tip Meckel, David Carr, and Curtis M. Oldenburg presented "Impact of seismic events on seal integrity, Texas Gulf Coast." Yuan Liu, Toti Larson, and Jean-Philippe Nicot gave the talk, "Theoretical and experimental study of controls on CO2 dissolution and CH4 outgassing rates." Changbing Yang, Jesus Delgado, Susan Hovorka, Patrick Mickler, Ramon Trevino, and Straun Phillips presented, "Monitoring dissolved CO2 in groundwater for CO2 leakage detection in a shallow aquifer." Katherine Romanak, Susan Hovorka, and Changbing Yang presented, "Detection of CO2 migration from depth to the near-surface." 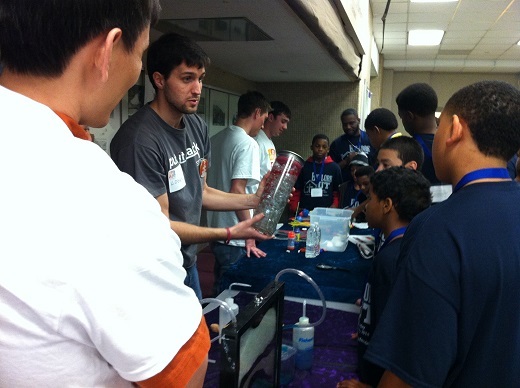 Tip Meckel and Steve Bryant presented "Buoyancy-driven flow in Heterogeneous Materials." Mehdi Zeidouni, J.-P. Nicot, Susan Hovorka, and Vanessa Nuñez-Lopez gave the talk "Effect of depth and leakage pathway flow properties on thermal response to leakage from CO2 storage zone." GCCC staff also presented the following posters: Seunghee Kim and Seyyed Hosseini, "Geological CO2 storage: Incorporation of pore pressure/stress coupling and thermal effect to determine maximum sustainable pressure limit;" Alexander Y Sun, Jiemin Lu, Seyyedd Hosseini, and Sue Hovorka, "Toward incorporating pressure-based leakage detection into monitoring programs at geologic carbon sequestration sites;" Rebecca Smyth, Paul G. Thomas III, and Christopher Heiligenstein, "Concerning offshore geologic storage of carbon dioxide in the USA;" Rebecca Smyth, Susan Hovorka, Katherine Romanak, Brad Wolaver, Patrick Mickler, and Changbing Yang, "Monitoring CO2: The quest for a clean signal (examples from UT Austin BEG research);" Katherine D. Romanak and G.L. Womack, "Field test of in situ sensor technology for process-based soil gas monitoring;" Seyyed Hosseini, Seunghee Kim, and Mehdi Zeidouni, "Application of multi-well analytical models to maximize geological CO2 storage in brine formations;" Tip Meckel, Susan Hovorka, Ramon Treviño, Rebecca Smyth, and Katherine Romanak, "Toward an international program for offshore storage of CO2: International Initiative for CCS sub-sea (iCCSc);" Jiemin Lu, Patrick J. Mickler, and Jean-Philippe Nicot, "Geochemical impact of oxygen impurity on siliciclastic and carbonate reservoir rocks for carbon storage;" Patrick J Mickler, Changbing Yang, and Jiemin Lu, "Laboratory batch experiments and geochemical modelling of water-rock-super critical CO2reactions in Gulf of Mexico Miocene rocks: Implications for future CCS projects;" Katherine D. Romanak, Susan D. Hovorka, and Changbing Yang, "Detection of CO2 migration from depth to the near-surface;" and Akand Islam, Aboulghasem Kazemi Nia, Kamy Sepehrnoori, and Tad Patzek, "Effects of geochemical reaction on double diffusive natural convection of CO2 in brine saturated geothermal reservoir." 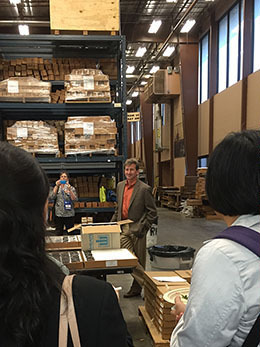 BEG Director Scott Tinker welcomed GHGT12 guests to CRC and GCCC staff including Tip Meckel, Pat Mickler, Changbing Yang, Jiemin Lu, Seyyed Hosseini, Susan Hovorka, Hilary Olson, Ramon Trevino, JP Nicot, and Behni Boli presented highlights of GCCC work. 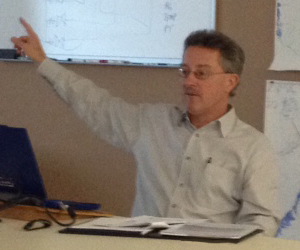 Greg Leamon has been helping develop definitions of CCS technical terms and MVA methodologies for ISO/TC265. September 30, 2014: GCCC completed a four and a half year study characterizing Miocene stratigraphy of the Texas coastal zone for CCS activities (link). The DOE-funded project (Gulf of Mexico Miocene CO2 Site Characterization Mega Transect) focused on the Texas state waters. Prospective reservoirs were identified within a sand-rich section in the lower Miocene below a significant mudrock confining zone (Amphistegina haueriana ("Amph b") biochronozone) and above the overpressured section. 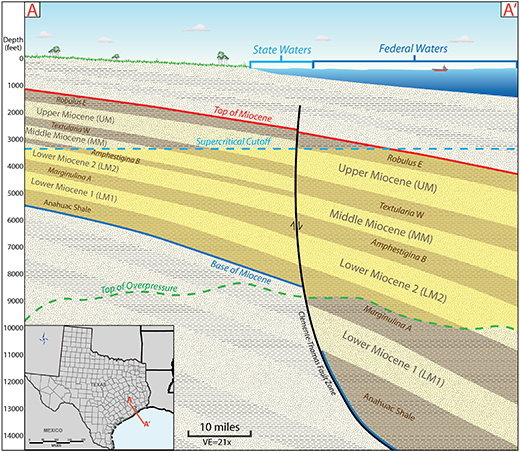 Favorable stratigraphy for CCS occurs in the middle- and upper-Miocene section beneath the offshore Texas State Lands. Wallace et al. (2014) Using subsurface methods developed by the petroleum industry, including biostratigraphic data, wireline well logs and 3D seismic, the reservoirs were characterized. The reservoir facies indicate deposition in shallow water (e.g., deltaic, strandplain, fluvial, etc.) depositional systems. A static capacity estimate of the study area yielded 129 Gt CO2. Various confining zones were also characterized both petrographically and by means of a high-resolution 3D ("P-Cable") seismic system acquired using funds from the study. By providing very high resolution seismic data of the shallowest (approximately 1 second) geologic section, the P-Cable system also allowed for macro-scale characterization of the natural fluid system (e.g., gas chimney) to more rigorously evaluate geo-sequestration targets. Sealing capacities of faults were also analyzed locally using a shale gouge ratio technique. This work concluded that faults in the area can serve as effective seals for CO2, as also suggested by natural hydrocarbon accumulations. 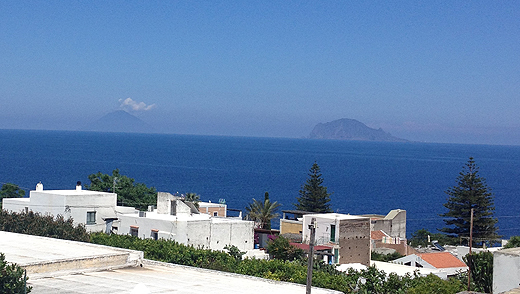 From the island of Salina, Italy the active volcano "Stromboli" (left) and the Island of Panarea (right) are visible. Panarea is an area of active magmatic degassing where CO2 fluxes across the seafloor. The site is an analogue for CO2 leakage from an offshore CCS site. It is a natural laboratory used by the European ECO2 project to study the effects of CO2 leakage in a shallow marine environment and to test monitoring approaches. 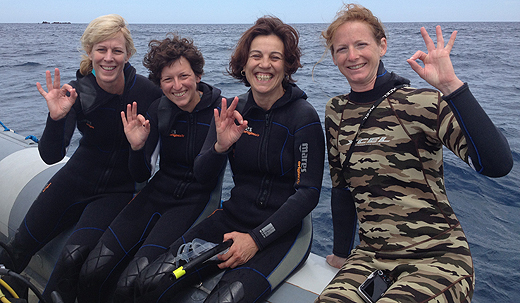 Romanak (on the left) and Italian colleagues prepare to scuba dive in the CO2 bubbles off the coast of Panarea Island, a natural laboratory for studying the effects of CO2 leakage at offshore CCS sites. Katherine Romanak provides technical information on CCS as part of a US Congressional Briefing Series. 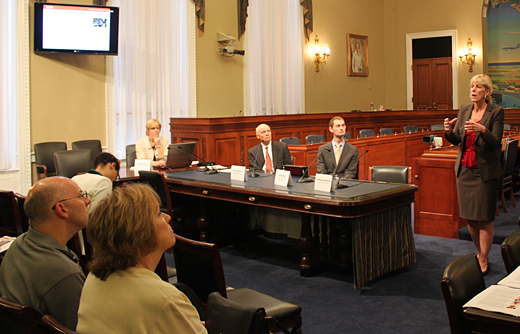 July 18, 2014: Katherine Romanak presented "Monitoring and Environmental Protection at Geologic Carbon Storage Sites" for the US Congressional Briefing Series "Energy from the Earth." The series was designed by a consortium of professional geoscience societies working together to inform energy legislation by making technical information available to US policymakers. The briefing on CCS was Part 6 of the series and entitled "Geologic Carbon Storage: Feasibility, Technology, and Challenges" and was presented once in the morning at a location within the House of Representatives and again in the afternoon at a location within the Senate. Topics included: geological requirements for carbon dioxide storage, potential for storage in the US, facility design and technology, strategies to minimize risk including groundwater impacts and the potential for induced seismicity, and monitoring needs for storage verification and public assurance. Other speakers were Peter Warwick (USGS) and Josh White (Lawrence Livermore National Laboratory) with Brenda Pierce (USGS) moderating. The presentations were well attended by members from the US Senate, the US House of Representatives and various subcommittees relating to Energy and Environment. The audience was engaged in the topic and many questions followed the presentations. Washington, D.C.
July 6-12, 2014: The 8th IEAGHG International CCS Summer School 2014, sponsored by The University of Texas at Austin™ and administered by GCCC, was an overwhelming success according to Tim Dixon, Manager Technical Programme and Manager CCS and Regulatory Affairs at IEAGHG. Dixon wrote that the course was "one of the very best. Amongst the many great outcomes, it resulted in 47 new CCS ambassadors going out across the world, and also new friendships and collaborations forged. The alumni now total 431, with over 47 hailing from the USA, and over 119 from developing countries." Significant credit is due to Hilary Olson, who organized the course, which included a field trip and hands on experiences for the students, as well as lectures and discussions with numerous GCCC staff. To view the winning student presentation debating whether CCS should be mandatory for developing countries, please click here. Delegates from Botswana and BEG staff during the training course. 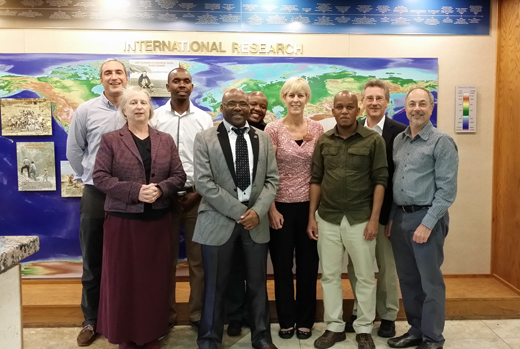 July 14-16, 2014: The Gulf Coast Carbon Center (GCCC) at the Bureau of Economic Geology hosted a CCS Training Course for a delegation from the Botswana Geological Survey and the Botswana Department of Environmental Affairs. The course was funded by the World Bank and organized by ERM, Carbon Counts, and Wellfields Geosciences with heavy involvement from International Energy Agency Greenhouse Gas Programme (IEAGHG). The goal of the visit was to expose the Botswana delegation to all aspects of CCS as they consider implementing the technology to support clean development of their expanding coal power plant infrastructure. Botswana is economically and politically suitable for implementing CCS due to a stable and strong economy driven by its diamond industry. The Training Course hosted at the GCCC followed the IEAGHG International Summer School and drew upon the GCCC's and the Summer School's international expertise to present information on all aspects of CCS including site characterization, modelling, monitoring, risk & safety, and policy and economic issues. 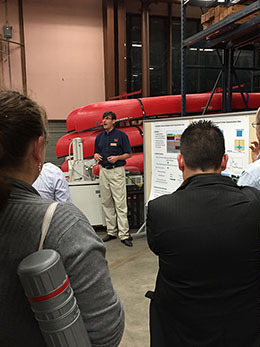 Hands-on activities included a CCS design project, a look at the core of a real CO2 storage formation, a tour of The University of Texas at Austin's™ Separations Research Program CO2 capture pilot plant, and the Hastings CO2-EOR facility in south Houston operated by Denbury Resources. In addition to the GCCC-hosted portion of the training course, the delegation from Botswana visited the South African CCS Center and learned about CCS from Sasol and the South African government. They also visited the UK where they met various government and industry officials and heard about Shell's CCS activities. The GCCC is proud to have played a major role in this successful exercise in building the world's capacity for implementing the important technology of CCS. June 25, 2014: Ecopetrol joins GCCC. We are delighted to welcome Ecopetrol, Colombia's State oil company, as a new member of the Gulf Coast Carbon Center Industrial Associates. GCCC Sponsor Liaison Hilary Olson says, "Ecopetrol's sponsorship for 2014 affirms the international recognition of the scientific creativity that goes on at the GCCC, and we look forward to productive collaboration with our first sponsor based in South America." Ecopetrol is an oil and gas company focusing on exploration and production; refining and petrochemicals; transportation, including the largest network of oil pipelines in Columbia; and market and supply. Headquartered in Bogota, Ecopetrol also conducts operations in Peru, Brazil, and the Gulf of Mexico. It is one of the 25 largest oil and gas companies and one of the four largest in Latin America. 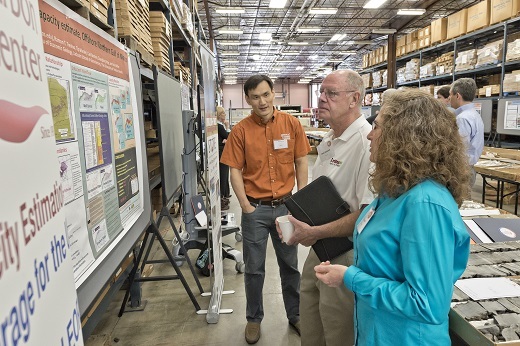 May 22, 2014: Stanford Center for Carbon Storage Annual Meeting. Susan Hovorka presented "Using EOR as Geologic Storage: Downsides and Benefits." Palo Alto, CA. June 9, 2014: Determining the storage capacity of any given rock formation is vital to qualifying it for possible CO2 injection and storage. Seyyed Hosseini and GCCC colleagues have developed a novel analytical solution for determining the storage capacity of geological formations, taking into account their thickness, porosity, area, shape, and other factors. For more, please click here. Masoud Alfi, Cristina Rivas, and Jack Jones help study carbon sequestration at GCCC this summer. June 9, 2014: Three students are joining GCCC for the summer. Cristina Rivas is a graduate student at the California State University at Bakersfield. In collaboration with Pat Mickler, she is performing high-pressure, high-temperature autoclave experiments, to quantify the effects of water-rock- supercritical CO2 interactions on formation brine geochemistry. Masoud Alfi is visiting GCCC from Texas A&M at College Station. This summer, he will be working on CO2 injection and history mapping at Cranfield field with Seyyed Hosseini. Jack Jones has returned to his hometown of Austin for the summer after finishing his undergraduate degree at the University of Oklahoma. He is working with Katherine Romanak on carbon sequestration in marine sediments. He will also be running solvent extraction experiments with BEG researcher Tongwei Zhang. June 10, 2014: United States Energy Association Technology Series. Tip Meckel was invited to present The Role of CCS in Diverse Energy Chain Developments & the Global Significance of Offshore Storage. Washington D.C.
Congratulations to Medhi Zeuiduni for two new papers recently accepted. Analytical model of well leakage pressure perturbations in a closed aquifer system has been published in the journal Advances in Water Resources. Monitoring the above-zone temperature variations associated with CO2 and brine leakage from a storage aquifer with coauthors JP Nicot and Susan Hovorka is in press in the Journal of Environmental Earth Sciences. 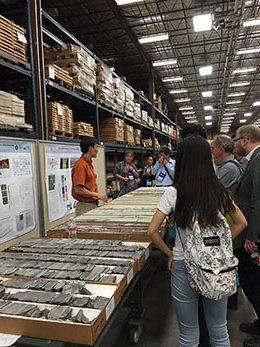 April 11, 2014: The Bureau of Economic Geology hosted Industry Day 2014 at the Bureau's Austin Core Research Center. The theme for this year's event was "Discovering the Bureau: Energy, Economics and the Environment." Industry Day 2014 highlighted the Bureau's unique position among research institutions, investigating such key research areas as unconventional oil and gas exploration and production, energy economics, salt tectonics, natural fractures and structural diagenesis, subsurface micro- and nano-sensing, reservoir characterization in carbonates, mudrocks, and sandstones, carbon storage in geological reservoirs, and the increasingly important water-energy nexus. Jiemin Lu and Becky Smyth speak to Mark Nibbelink from DrillingInfo about capacity estimation at Cranfield, with cores from the confining interval in the background. The Gulf Coast Carbon Center hosted a booth giving a program overview and staff were be available to answer questions throughout the day. Cores from the injection zone and caprock from the Cranfield Field, Mississippi sequestration site were on display. During the morning environmental session (9:30-10:25) Katherine Romanak gave a talk "New process-based approach to gas leakage detection in groundwater and soils at geologically-engineered sites." In the afternoon session on energy (12:30-1:25pm), Mehdi Zeidouni presented "Thermal signal induced by CO2 leakage from injection zone." Austin, TX. 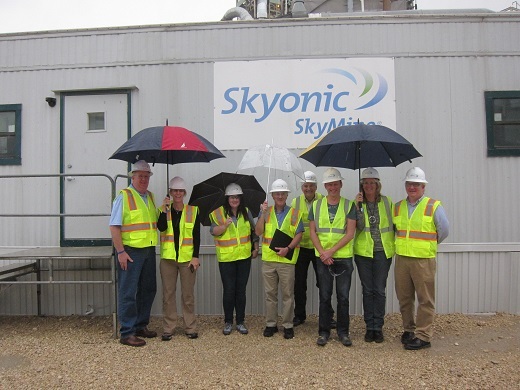 Katherine Romanak, second from left, on a tour of SkyMine. Logan West explains that CO2 is buoyant in brine reservoirs. 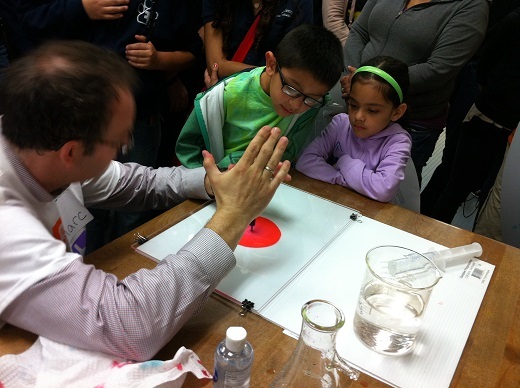 Marc Hesse uses a glass reservoir to demonstrate CO2 injection. Feb 27, 2014: Third Annual Americas Forum: Moving CCS Forward - Actions and Opportunities. Susan Hovorka will be part of a technology roundtable: The CCS/CCUS Technology Horizon for 2020 and Beyond at the Embassy of Canada, Washington D.C.
Susan Hovorka welcomes attendees to UTCCS-2. 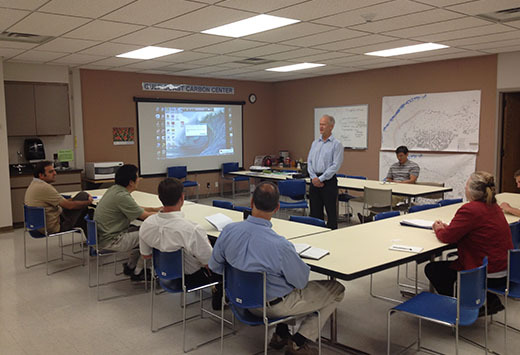 January 14, 2014: 2014 Underground Injection Control Conference, Groundwater Protection Council. Susan Hovorka presented "Reporting Storage Effectiveness for EOR." New Orleans, LA. 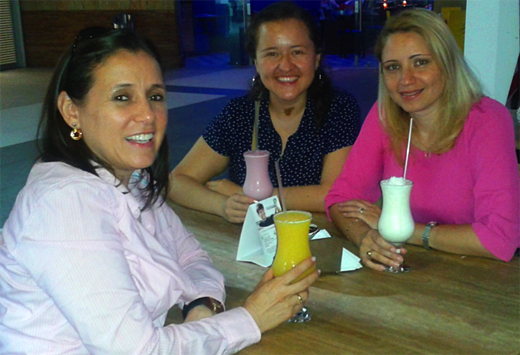 January 14, 2014: Global CCS Institute Webinar on CCS in Venezuela. The Orinoco Belt located in southeastern Venezuela has the potential to be the largest essentially untapped oil accumulation in the world, with an estimated mean volume of 513 billion barrels of technically recoverable heavy oil, according to a US Geological Survey. A Venezuelan Technical Collective with an interest in limiting the impact of the country's carbon intensive activities on climate change contacted the Global CCS Institute to explore the global status of carbon storage technologies and projects. In response, Vanessa Nunez presented a webinar in Spanish on the Global Status of Carbon Capture and Storage and EOR with a focus on CCS in Venezuela. January, 2014: The Bureau congratulates J.P. Nicot who received the Jackson School of Geoscience's most prestigious award, the Joseph C. Walter Excellence Award, for excellence in areas including research, teaching service, professional activity, and administration. 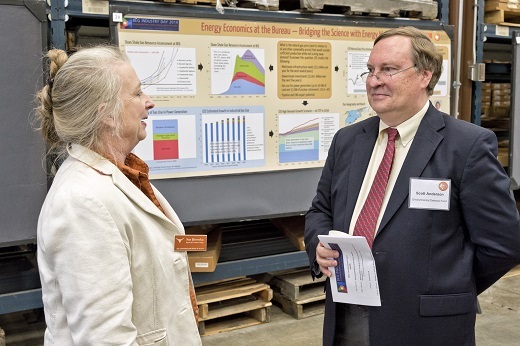 J.P. served as Principal Investigator on multiple projects during the past year and garnered special attention for his studies concerning water resource management and water use in shale production. January, 2014: Congratulations Alex Sun, Seyyed Hosseini, and Jiemin Lu, who have received a substantial grant from the Department of Energy's National Energy Technology Laboratory for a 3-year program to develop a pressure-based inversion and data assimilation system (PIDAS) for CO2 leakage detection. One of the current major hurdles to industrial-scale implementation of geological carbon sequestration projects is the potential migration of fluids from the storage formations and the resulting liabilities. The ability to accurately identify leakage pathways from the storage zone is crucial to site licensees and regulators. Pressure-based monitoring technology remains the most cost-efficient and reliable technique for early detection, and provides the greatest detection potential for broad areal coverage. The proposed PIDAS tool will expand and strengthen existing pressure-based techniques for leakage detection in GCS repositories, and research will employ advanced analysis, laboratory experiments, and field tests to develop more effective methods for identifying leakage pathways.